If you are considering ringing the changes in your bedroom décor then one of the dilemmas you may weigh up is whether to go for traditional free standing furniture (traditional in terms of the norm rather than style!) or fully fitted furniture. We often have very prescribed ideas about home furnishings and what works where, for example a fitted kitchen is very much the accepted model whereas other rooms in the house tend not to be. Fitted bedrooms were very popular in the 70s and 80s, waned in popularity over the following couple of decades (as the nation’s obsession with Ikea and other discounted furniture retailers fuelled a ‘disposable’ approach to home furnishings) but is now experiencing a resurgence in demand. 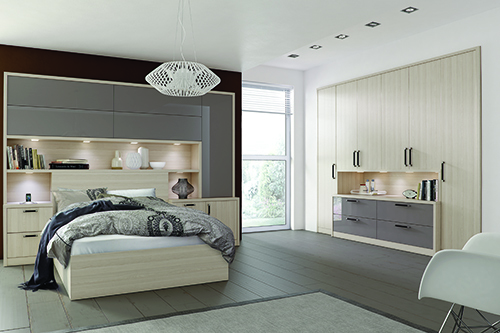 Why wouldn’t you choose a fitted bedroom? Too fixed – some don’t like the idea of furniture being fixed in place; they want to be able to move it around when they want a change. This is a valid concern but the question is, how often do you change your bedroom around? In reality, few of us ever really bother to rearrange our bedrooms. Unless you have a very big room with lots of options, the chances are that there will be an optimum floor plan that makes the best of the space you have. If this is the case then why fix what is not broken? How many of us have emptied wardrobes and drawers, heaved beds around and changed everything only to find that it was better the way it was before! A fitted bedroom is fixed, that’s certainly true, but it’s been designed to make the absolute best use of the space therefore why would you ever want to change it around? Of course its fitted nature means that you wouldn’t be able to take it with you should you sell the house but it could well increase the attractiveness of your home to potential buyers. Too expensive – fitted furniture is definitely more expensive than furniture from a discounted retailer, however, if you compare like for like on quality the differential is probably less than you might think. Remember that when you choose ‘off the shelf’ furniture from a store you’re doing the design work (in terms of how it will work in your room) and you may even need to build it up yourself. By nature there is a bespoke element to a fitted bedroom scheme; it needs to be designed to the exact specifications of your space and it needs to be installed. This is where much of the extra cost goes but with it comes the benefit of a custom design and professional craftsmanship. You may think that recent years of recession and austerity would have drawn us more to low cost, throw away pieces but that’s not the case; for many it’s made us realise that cheap bought several times is actually more expensive than buying quality once. Maximised space – a fitted bedroom is designed to fit into the exact specifications of your room and makes use of every last bit of space. With free standing furniture, you a re fitting pre-determined boxes into a pre-determined space and just trying to get it right. With fitted furniture you can make use of every nook, cranny and corner and that means tons of storage without compromising additional floor space. This is especially useful for awkward spaces such as lofts or rooms with difficult bulk heads or chimney breasts. Fitted furniture has come a long way over the last 10 years and we hope that we’ve dispelled some of the assumptions you may have had. If you think you’d like to consider a fitted scheme for your bedroom we’d be happy to offer you a free consultation to show you what the possibilities are. Simply contact us or call 0800 321 3491. 0 Responses to "Fitted For Purpose?"